But Mr. Cicilline, saying he did not have confidence in the veracity of what Mr. Trump tweets, pressed Mr. Whitaker to answer under oath about whether the president had lashed out or otherwise expressed dissatisfaction over the Cohen case developments. “No, he did not,” Mr. Whitaker said. Mr. Whitaker also told several lawmakers that he had never talked to anyone at the White House or in Mr. Trump’s circle about his views of the Mueller inquiry before joining the Justice Department in September 2017 as chief of staff to Jeff Sessions, then the attorney general. Mr. Whitaker had made public comments that were skeptical of the Russia investigation during that period, and The New York Times has reported that in July 2017, Mr. Whitaker had interviewed with Donald F. McGahn II, then serving as Mr. Trump’s White House counsel, about the possibility of becoming the main White House lawyer who would manage and respond to the Mueller investigation. The White House instead ended up giving that job to Ty Cobb. 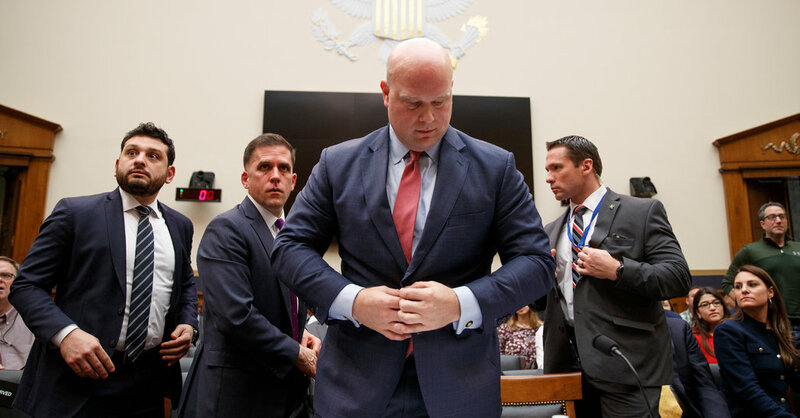 Later, under questioning by Representative Eric Swalwell, Democrat of California, Mr. Whitaker acknowledged having applied for the job that went to Mr. Cobb. But he said he had spoken only with Mr. McGahn’s chief of staff, Annie Donaldson, and not Mr. McGahn himself about it. Either way, when Mr. Swalwell expressed incredulity that his views of the Mueller investigation would not have come up during such an interview, Mr. Whitaker insisted that Ms. Donaldson had not asked about them. But at the end of the hearing, Mr. Nadler called Mr. Whitaker’s testimony on the topic of communications with the White House before joining the Justice Department inconsistent at best. And Mr. Nadler reiterated his intention to call Mr. Whitaker back for another interview, “under subpoena if necessary,” to answer additional questions he had declined to address on Friday.